Finally, some blooms in the backyard. 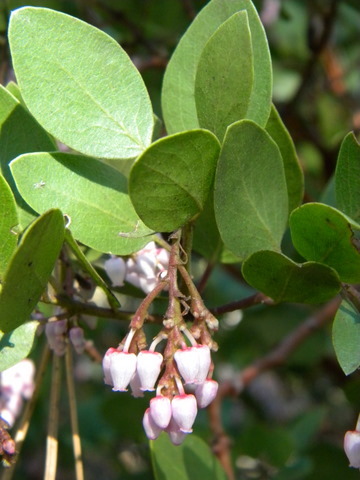 Plants like this greenleaf manzanita (Arctostaphylos patula) are some of the first plants to flower in the mountains. These native, evergreen shrubs retain their leaves over the winter and for multiple years. Many perennial forbs and shrubs must recreate their entire ‘solar array’ (leaves) each spring. But this manzanita can expend a little bit of energy on maintaining the leaves it has and building a few more, then get straight to the business of producing tidy, bell-shaped flowers. Some other deciduous species, like dogwood and redbud, have a different strategy and use last year’s food reserves to flower first, then grow leaves that will enable them to again produce food. Though California is a hotspot of manzanita diversity, boasting over 50 different species, this is the manzanita that you are most likely to see around Westwood. It is 3-6 feet high, with bright green leaves that come to a slight point at the tips. In the sunlight, you can see bight, golden glands on the twigs and petioles. The genus name is from the Greek Arktos (‘bear’) + staphyle (‘bunch of grapes’). Guess who loves to eat the berries!